This is an amazing story of Father and Son, Chef Rene and Chef Maxime Meilleur and their amazing path starting from farmer’s family to becoming world renown Chefs. The Meilleur Family (the Best in French) could not have chosen a better name : the Michelin Guide has given the Third star in 2015 and their restaurant La Bouitte becomes the highest 3* Michelin in Europe. This recognition certified their work and recognized their place among the best chefs in the world. It is the singular path of a father and a son – René and Maxime Meilleur – who are enthusiast and self-taught men. Away from the trends, they created a new art of cooking and hosting. In 1976, aged 26, René, son of a cabinet-maker and farmer, purchased a potato field in Saint-Martin de Belleville. With his wife Marie-Louise, he literally created with his own hands « La Bouitte », « small house » in regional dialect. It is a piece of heaven protected in the Vanoise massif, at the gates of the largest skiing area of the world : the 3 Valleys. At the beginning, René and Marie-Louise served fondues and local cuisine. So much ground covered since the beginning ! With creativity and common sense, they foresee and create news trends. In 1985, a memorable dinner in Paul Bocuse’s restaurant became the trigger point. René and Marie-Louise made their dream come true. Fond of gastronomy, they turned towards « haute cuisine ». in 1996, the arrival of their son Maxime gave a new impulse. Former biathlete in the junior French team, he draws his forces from sports values : rigour, endurance and surpassing of oneself. Gradually, he pushes the team towards a search of absolute. His sister, Sophie, joined the adventure in 2000 and they all together created step by step 16 bedrooms and suites, full of charm. 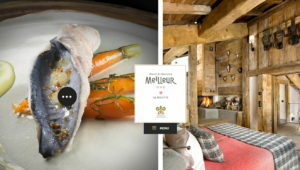 All the family, spouses included, did their best efforts to move moutains and built the chalet stone by stone, year after year, to create an unique place of culinary and oenological experiences. René and Maxime compose a cuisine dedicated to nature. La Bouitte is a rare balance between simplicity and elegance and between exactness and risk taking. « The home and our dishes look like us : a fine and teasing cuisine which awakes the culinary heritage of Savoie by paying to it a faithful tribute ». With one voice, René and Maxime Meilleur recognize that the first Michelin star, obtained in 2003, was hard to get because the Valley was not yet a gastronomic land as it is today. « The first Michelin star was the start of a beautiful adventure for a cook and for all the village and placed the spotlights on our home. But we had to wait 2008 and the second Michelin star to reach the next step and make a cuisine that looks just like us ». The third Michelin star is a completion. It is the first time in the history of French gastronomy that a father and a son team obtain the first, the second and the third stars. As Maxime explains : « With my father, it is as if we reached the top of the mountain, with a spectacular view in front of us. A new life begins, with the desire to go further, to deliver a cuisine rooted in Alpine heritage and to bring exceptional products often unknown on our table ». 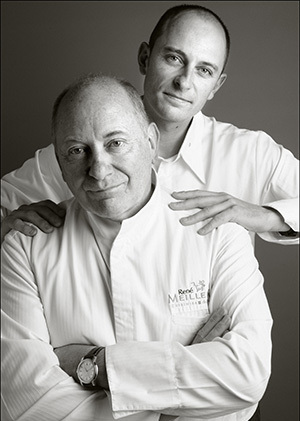 Hand in hand, René and Maxime Meilleur has celebrated in 2016 the fortieth anniversary of La Bouitte. We are talking to one of these Great Chefs, the Son Maxime Meilleur. What inspired you to become a Chef ? Where there is a will, there is a way ! What is the message that you are sending to the public-guests, with your Food at La Bouitte ? How difficult it to be Creative all the time and constantly look up for new ingredients and invent new dishes and recipes ? What did the 3rd * Michelin star mean to you ? Now that you have reached the Top and 3 *** Michelin , What happens next for “ La Bouitte” ? What is the new challenge and aspiration in the upcoming years? To restructure La Bouitte to adapt better to the customer frequency. How difficult is to maintain this Father –Son partnership in the kitchen ? It’s very easy, one without the other we would not have the third Michelin Star. Are there ever any arguments happening and what they are usually about ? What mistakes in the kitchen, you will never forgive? What qualities do you look for when employing a new team member in the kitchen? What is your advice to young Chefs who aspire to get a Michelin star ? Would you consider yourselves Creators of New Culinary trends and what are the new trends by your opinion? What is your favorite local ingredient that you can’t do without in your kitchen? Do you ever import ingredients from other countries and continents? There are so many. Restaurants with farm product, a local cuisine appeals me. Very good products with a good environment. What is your favorite activity except cooking ? Not being good enough at skiing to go with the French team to the Olympics. What is a definition of ” Top Chef” by your opinion ? Someone passionate, who loves to please and who listens a lot. Someone humble. Why all Top Michelin star chefs are Men ? While women are cooks in the family,why there are so few in the restaurants? Women are more refined and perfectionists than men, but the job is physically hard and difficult. Which is your favorite “ Soul food” dish that you’ve created ?